We compare the best entry-level luxury performance cars on the market in 2017 with the enthusiast driver in mind and maybe the youth movement! This comparison in the small niche of entry-level luxury performance cars was always going to be tough. Particularly when the Mercedes-Benz A45 AMG has the best sales numbers. Add, this car ‘began’ the new direction in entry-level luxury performance cars that were well priced ( compared to older siblings ) in 2013. At that time it was the most powerful production 2.0-litre engine with a luxury brand name attached. Fast-forward to 2016 and BMW release the first serious competitor, the BMW M2. The BMW M2 arrived with fan-fair and has earned its place in the market. Since 2013 Mercedes-Benz has made small incremental changes to the original. Just enough to keeps things interesting but not too much to risk alienating their solid position in the market. Enter the new BMW M2 with fan fair. Its introduction late last year was one of the most anticipated releases by BMW enthusiasts since the E30 M3 was released way back in 1986! The hype and excitement around the BMW M2 did not disappoint winning ‘Australia’s Best Drivers Car’. So you can see, this is a tough exercise. Probably the two best examples in this entry-level luxury performance class. Although it would be remiss not to put the Audi RS3 in the mix. How do you choose when both these cars are for people who love to drive and who are well on their way to achieving success in life and work! Edgy muscular modern design, that is aerodynamically sleek, strong front-end in the new A-wing design, 19’alloys, smart backend giving it a distinctive visually attractive design. Dynamic Select Driving Modes, 5 in total with the Dynamic Plus package; Individual, Comfort, Sport+ and Race. Spoilt for choice. Option up to the new front differential lock system to even out the torque a bit more so when you hit the corner at speed the exit is under control. The exhaust note is awesome or ‘emotional’ as Mercedes-Benz describe it from the superbly engineered AMG motor. Carbon fibre, highlight touches of AMG red including the distinctive seat belts, use of silver-coloured aluminium on dials, paddles and peddles. Active M Differential – that is the distribution of the drive torque between the two rear wheels optimising traction and driving stability during lane changes and acceleration this means improved performance and control. Note this is electronically controlled and cannot be turned off. Blue metallic brake callipers with the M logo…smart detail. You know you have joined the M family as you slide into the driving seat, subtle use of red-and-blue M-department stitching and coarse-weave carbon-fibre trim. What is our conclusion? We tossed it around the office and had some very serious debates about what should be the criteria. Is it speed around the racetrack, looks, technology, handling or value for money that should determine the winner? Let’s unpack that. Speed around the track; the BMW M2 was the clear winner as seen from the specs and the video done by the good people at Car Advice. 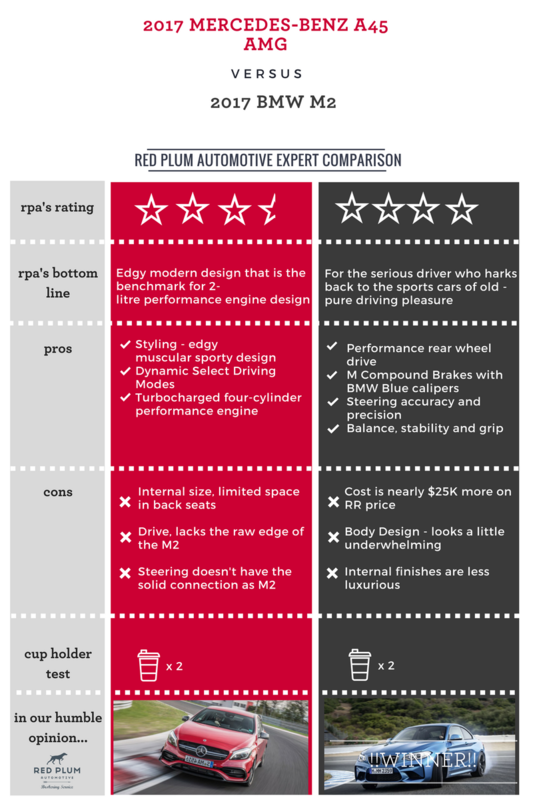 Looks; such subjective criteria and our office were split however the Mercedes-Benz A45 AMG had the win here. Technology; from the power achieved in the straight 6-cylinder engine and rear wheel drive train to the stability on a mountain road or a race track this car is brimming with new engineering technology. Handling; very close again but the AMG Dynamic Select driving mode adjustment system wins us over based on choice and your mood. Value for money; with the BMW M2 coming in nearly $25,000 more comparing like to like specs. Mercedes-Benz A45 AMG wins here, a premium product that balances luxury, style and performance for quite a bit less than the BMW M2. What would we choose? In our humble opinion, the decider for us in a car like this is the sheer joy of driving. The BMW M2 has the edge. It is so much fun to drive and whilst it is the baby of the M family it does not disappoint. So for the enthusiasts out there, you won’t be disappointed. In conclusion, we leave you with these words from BMW “in a BMW M2 the focus is on one thing: pure driving pleasure. Everything else can be delegated”.